"I am the living bread which came down from heaven. If any man eat of this bread, he shall live for ever; and the bread that I will give, is my flesh, for the life of the world. ... Amen, amen I say unto you: Except you eat the flesh of the Son of man, and drink his blood, you shall not have life in you. He that eateth my flesh, and drinketh my blood, hath everlasting life: and I will raise him up in the last day. For my flesh is meat indeed: and my blood is drink indeed. He that eateth my flesh, and drinketh my blood, abideth in me, and I in him." The other Sacraments give us grace, the Holy Eucharist gives us not only grace but the Author of all grace, Jesus, God and Man. It is the center of all else the Church has and does. 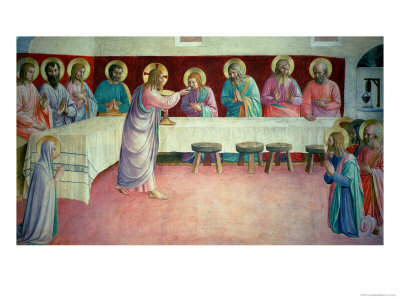 As St. Mark records that, at the Last Supper, Jesus "took bread, blessed and broke it and gave it to them: "Take this, this is my Body" (Mk 14:22). That word blessed in Greek is eucharistesas, from which the Eucharist derives its name. Three of the four Gospels record the institution of the Holy Eucharist: Matthew 26:25-29; Mark 14:22-25; Luke 22:19-23. St. Paul also records it in First Corinthians 11:23-25. St. John's Gospels does not report this, presumably because he intended chiefly to fill in what the others had not written, for he wrote probably between 90 and 100 A.D. There are small variations in the words, but the essentials are the same in all accounts: This is my body... this is my blood. In John 6:53 Jesus said: "Unless you eat the flesh of the Son of Man and drink His blood you will not have life in you." Of course, He did not mean to cut off salvation from those who through no fault of their own do not know or grasp this truth. It is like the case of Baptism: one must receive it if one knows. The form, that is the words required for the Eucharist, are of course the words of institution. The matter is wheat bread (white or whole wheat) for the host, and natural wine (mixed with a very little water) for the chalice. Addition of a notable amount of other matter would make the material invalid. Jesus is present wherever the appearances (species) of bread and wine are found after the consecration. Hence He is found even when the host is divided. The substance of bread and wine is gone, only the appearances remain. The Church calls this change transubstantiation: change of substance. In John 6:47-67 Jesus did not soften His words about His presence even when so many no longer went with Him: had He meant only that bread and wine would signify Him, He could have so easily explained that, and they would not have left. The Church has always understood a Real Presence. For example, St. Ignatius of Antioch, who was eaten by the beasts in Rome around 107 A.D., wrote: "The Eucharist is the flesh of our Savior Jesus Christ" (To Smyrna 7:1). St. Justin the martyr wrote around 145 A. D: "We have been taught that the food is the flesh and blood of that Jesus who was made flesh" (Apology 1. 66. 2). The Council of Trent in 1551 defined that Jesus is really present in the Eucharist, body and blood, soul and divinity. Obviously, this divine presence deserves our worship. Really, someone who believes in it should be much inclined to come before the tabernacle often. Benediction with the Blessed Sacrament seems to have started in the 15th century. The Church also promotes Forty Hours devotion. In some places there is perpetual adoration.